← The pleasure is ALLLLL mine! When I was growing up in Shiraz, we had a house on Hedayat Street with several fruit trees in its backyard. Most vividly, I remember our grapevine. My mother planted it at a cozy corner as soon as we purchased the house and in a couple of years it grew into a tall, wide tent of green grapes, providing Mom the supplies to cook stuffed grape leaves (dolmeh barg-e mo) at least twice a year. 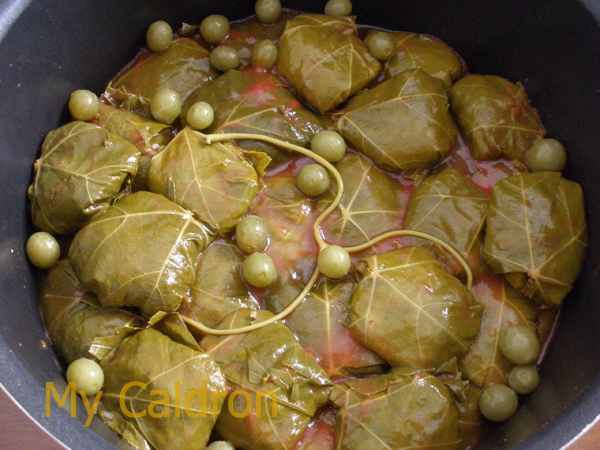 She did it once in spring when the grape leaves were so small and tender she had to stack two leaves to cover the cracks and wrap one tiny dolmeh – the way she shaped them in squares, rather than rolling them up like cigar. 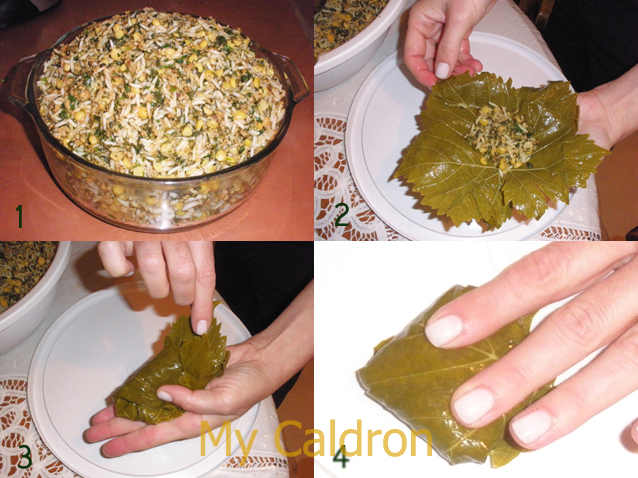 Before the end of the season in late summer, she also picked another round of leaves for freshly made dolmeh. Leaf: No all brands of preserved leaves are good. In fact a few are: Orlando California is ok. And Mezzetta is even better. Take the leaves out and place them in a large container of cold water for 10-15 minutes and then rinse them thoroughly to wash off the salt and acid and the harsh taste that go with them. Place leaves in a colander to drain and meanwhile cut off the stem on top of each leaf. Filling: You should have your filling or stuffing ready of course, and here I gave my method for doing so. 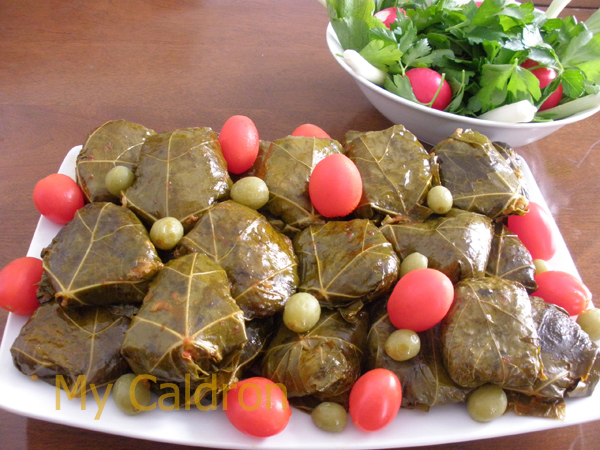 My suggestion: Prepare enough filling (the amount indicated in this recipe) to make several stuffed vegetables and a medium size dish of grape leaf dolmeh (about 30). Sauce: Fill in 2/3 of a large cup with V8, or tomatoes juice, Add 1 tbsp. lime juice, 1 tbsp. olive oil, 2 tbsp. sugar. Fill up the cup with hot water. Pour the sauce over dolmeh wraps in the pot and cover the pot’s lid and bring to boil on medium heat. Now you have plenty of steam accumulated in the pot. Turn to low heat and cover the lid in a clean kitchen cloth and steam cook at least for one hour, but not more than one hour and half. Turn off the heat, take off the lid and let cool for 15 minutes. Then carefully start arranging dolmeh, one by one, in a nice dish. Grape dolmeh is good with gojeh sabz (green sour plums) or ghooreh (unripe grape) if you are lucky enough to have access to them; If not, well.. 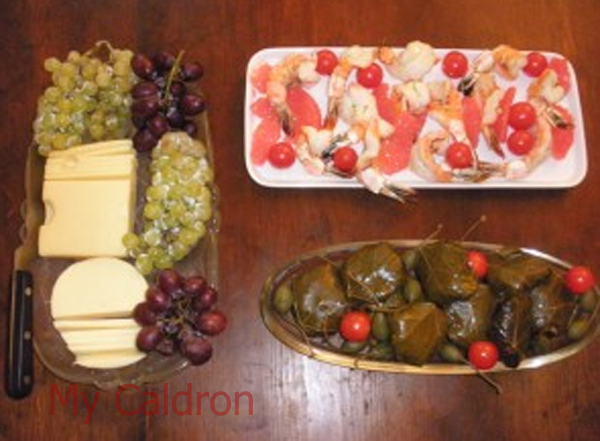 I decorate them with cherry tomatoes and marinated Caper berries, and they taste wonderful with dolmeh, believe me! Stuffed vegetables taste nicer when served hot, but grape leaf dolmeh is delicious cold and hot – perhaps even more delicious when it is cold, especially when served with other chasers or appetizers and nibbled with dear friends!! Kheili ajibe, man ham in Khatereh ra az madaram va derakhte Anghoor Dar baghe pedarim Dar shomal daram. Madaram hadeaghal sali 2 bar dolme barge moe dorost mikardand. Mamnoon misham ageh liste ingredient ra benevisied.